Sarah Schlesinger - GLOBAL ONCOLOGY, INC.
Sarah J. Schlesinger MD is currently an Associate Professor of Clinical Investigation at The Rockefeller University and Senior Attending Physician at The Rockefeller University Hospital. As a 17-year-old in high school, Sarah went to work in the lab of Dr. Ralph Steinman and the late Dr. Zanvil Cohn at The Rockefeller University, just a few years after they published their discovery of dendritic cells. Some 40 years after the discovery, Schlesinger works to exploit the ability of dendritic cells to orchestrate the body's immune response, in order to develop new therapies for diseases ranging from cancer to HIV. Sarah graduated with honors from Wellesley College and obtained her medical doctorate from Rush Medical College in Chicago. Sarah trained in Anatomic Pathology at the New York Hospital/Cornell Medical Center, and has a distinguished research and teaching career: at SUNY Buffalo Medical School; led The Dendritic Cell section of The Division of Retrovirology at the Walter Reed Army Institute of Research ("WRAIR"); worked with the International AIDS Vaccine Initiative as a Scientist in Vaccine Research and Design; and returned to Rockefeller University in 2002 to lead clinical efforts to bring new HIV vaccine candidates developed at Rockefeller into the clinic. 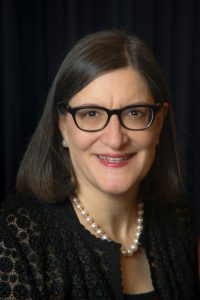 She is now the chair of the Rockefeller University’s Institutional Review Board and directs the Clinical Scholars training program and the education and training programs at The Rockefeller University Center for Clinical and Translational Science. Sarah serves on the boards of AVAC, Global Viral and the Hastings Center. "I am deeply honored to be included in the important work of GO. I am delighted to be able to contribute to bringing state of the art cancer care and education to those who need it most."